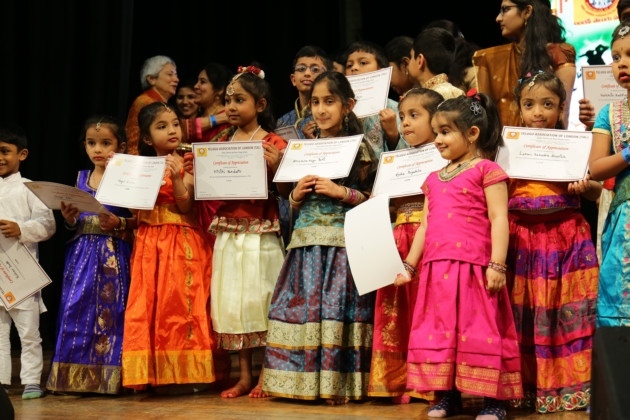 Youngsters and adults alike took to the stage at Redbridge Town Hall, High Road, Ilford on Saturday to mark Ugadi – a Hindu New Year festival celebrated in Andhra Pradesh, India. Dancers dazzled audiences with south Indian classical pieces at the Telugu Association of London (TAL) event, before Indian film singers Anudeep Dev and Lipsika made an appearance and performed for the crowd after flying in from India. Actors also took to the stage for dramatic pieces before guests enjoyed a vegetarian south Indian meal and Ugadi pachadi – a dish made of jaggery, mango, neem flowers and tamarind, which is traditionally eaten during the New Year celebrations. “It was brilliant,” said TAL vice chairman Balaji Callur. The 42-year-old, from Newbury Park, said Ugadi was all about celebrating the changing seasons and a fruitful harvest. Among guests were Ilford South MP Mike Gapes, Telugu cinema’s Varun Sandesh and doctor, playwright and actor Dr Kadiyala Vivekananda Murthy, who was given a Lifetime Achievement Award at the event. Former trustee Vamsee Mohan said he was “inspired” seeing the children taking part in traditional Telugu art forms. “It was great,” he said. “We had a lot of fun.